While some 15,000 acres of apples covered Sonoma County in the 1940s, that number was halved by the 1980s and in the low thousands by 2016. Homes and wine grapes have mostly absorbed our old orchard land. Just in the nick of time, a new type of apple evangelist has come to Sonoma County, one as content to cultivate what’s already there as to plant for new. In fact it’s fair to say that this is the era of the orchardist. Ned Lawton, his wife Michelle Lawton, and their partner Ryan Johnston are orchardists who comprise the team at Ethic Ciders. 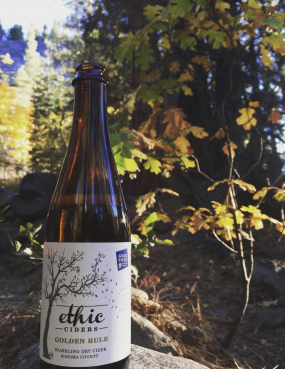 Dedicated to regenerating their land, the team at Ethic makes cider by growing soil. On a recent morning, Ned Lawton and farmer/cider maker Ryan Johnston took a visitor around the orchard to see how their dedication to regenerative agriculture is doing. Having won a prestigious 2018 Good Food Award for their Golden Rule cider, the agreement seems to be that it’s resulting in a superior product. Naming their company after a set of moral principles keeps the Lawtons and Johnston honest. Ethics speak to conduct; Ethic Ciders speaks to what the land needs. The results are delicious, but the name could feel like a burden. Whether he’s leading by example or merely doing what’s best for his land, Johnston spends much of his time coaxing nutrients back into the orchard’s sandy soil. Farmed for decades without maintainance, the orchard was sorely in need of some TLC and nutrients. By tending to it with the attention of a parent, Johnston has been able to coax this hillside back to life. By regenerating the land through carbon retention in the soil, Lawton and Johnston have changed its course so significantly that the orchard is now certified organic, tilled and watered only when needed, and cover-cropped each winter. To grow better apples and make better cider, bluebird boxes have been added and hedgerows planted. Ethic’s orchard is one of the first in Sonoma County to complete an Orchard Carbon Farm Plan in conjunction with the Gold Ridge Resource Conservation District and an arm of the USDA. This dovetails into a 2017 California Initiative, the Healthy Soils Program, that offers grants to farmers who are willing to change their land practice methods to honor the very ground on which they grow. The Lawtons and Johnston are betting that the results are worth the extra expense and effort. They’re discovering it to be true. This article adapted from one originally published in the September/October 2018 issue of Made Local Magazine. This entry was posted in Meet the Makers and tagged apples, carbon, cider, farmers, farming, soil.